Many Airlines, To Prevent Disruption Of Cockpit Operations, Require Their Pilots and Co-Pilots To? Though it is not a mandated rule across the industry, there’s one very common practice shared among many airlines: on flights long enough for in-flight meals, the pilot and co-pilot don’t eat the same food in order to avoid suffering from concurrent food poisoning. If that sounds a whole lot like one of the gags in the 1980 satirical comedy film Airplane!—seen here—it should, because it was. Most of the crew, including the pilots, ate bad fish and suffered from severe food poisoning during the course of the film. 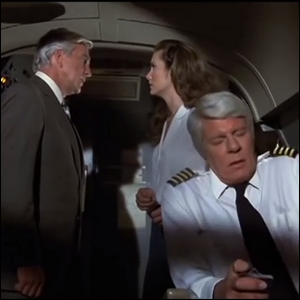 Just because it made for a hilarious side gag in Airplane!, however, doesn’t mean it’s not a real consideration and risk. In fact, food-borne illness is the leading cause of pilot incapacitation. We don’t know about you, but on our next trans-Atlantic flight, we definitely don’t want our pilots feeling delirious and suffering from dehydration.